At Okanda beside a rocky outcrop there is a shrine dedicated to the Kataragama God Skanda or Ukantha Malai Velayudha Swami. The site is traditionally known as one of the places where Ravana, the ten-headed Lord of Lanka and a devout worshipper of Shiva, halted for worship on his journey from Lankapuri to Koneswaram in Trincomalee. Okanda hilltop has by tradition been declared to be one of the places where a divine ray (katir) from Lord Skanda struck. 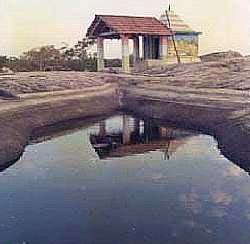 The Batticaloa Manmiam narrates the story of how Shiva's son Skanda defeated the Demon Asura by splitting the Vahura hill into two. Three splintering rays which originated thence from the ocean, were sheltered, one on the Okanda hilltop, one on a white naval tree at Tirukkovil and the third on a tillai tree at Mandur. Subsequently, all these places were reverentially observed as holy places by the Wanniya-laeto (inhabitants of the Wanni forest) also called the Veddas. On the top of the Okanda hill the aboriginal hunter-gatherers, the Veddas, preserved the sanctity of the location with a simple shrine of sticks and leaves dedicated to the jungle goddess Valli Amma. Depending on individual faith, people believe the whole region is impregnated with the spirit of Kande Deviyo, Kande Yakka, Kataragama God, Skanda, Murugan or al-Khidr, the Green Man of the Qur'an - teacher to Moses. The multicultural nature of the Kataragama region enables Buddhists, Hindus, Muslims and Christians to practice their faith in the safety of a sacred area. Hills, certain old trees, rocks and points along rivers are landmarks in a culture where everything is sacred and connected with mythical exploits. The area is indeed considered 'God's land'. 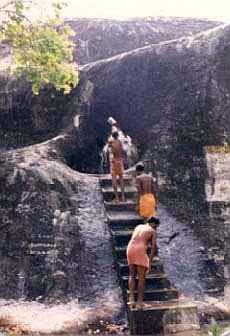 The caves at Kottadamuhela, near by, were a gift to the Sangha of the four quarters of the world, past, present and yet to come by the descendants of an independent dynasty of Kshatriya who reigned over southeast Ceylon with its seat in Kataragama. The emblem of the fish, found in the caves in this region, is the insignia of these independent rulers. This entire region, as attested to by ancient cave inscriptions, has been used for similar purposes to those of this initiative since before the time of Christ.